Return to Home > Afslankproducten> Scitec nutrition - Top Shape - 180cap. WEIGHT LOSS & BLOOD CHOLESTEROL MANAGEMENT WITH GLUCOMANNAN FIBER! 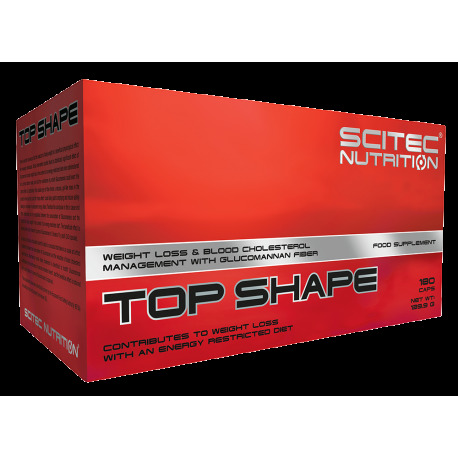 Contributes to weight loss with an energy restricted diet. There’s scientific consensus that the reduction of body weight is a beneficial physiological effect for overweight individuals. Clinical intervention studies found a statistically significant effect of Glucomannan on body weight loss in the context of an energy-restricted diet when administered as a pre-load before meals, and that the mechanism by which Glucomannan could exert the claimed effect is established: this soluble-type of fiber forms a viscous, gel-like mass in the stomach when hydrated, and this “mass effect” could delay gastric emptying and induce satiety leading to a decrease in subsequent energy intake. Therefore the conclusion is that a cause and effect relationship can be established between the consumption of Glucomannan and the reduction of body weight in the context of an energy-restricted diet*. The beneficial effect is obtained with a daily intake of 3 grams of Glucomannan in 3 doses of 1 g each (3x2 capsules). Similarly, on the basis of available scientific data it is concluded that there is a cause and effect relationship between the consumption of Glucomannan and the reduction of blood cholesterol concentrations. Maintaining normal blood cholesterol is beneficial to health! Glucomannan contributes to the maintenance of normal cholesterol levels*, and the beneficial effect is obtained with a daily intake of 4 grams of Glucomannan (8 capsules). Allergen Info: Manufactured in a facility that processes milk, soy and egg proteins, and gluten, peanuts! Store in a cool, dry place. For weight loss – within the context of an energy-restricted diet – take 2 capsules together with 1-2 glasses of water before 3 meals a day. Adequate liquid intake is necessary to ensure that the capsules reach the stomach. For the maintenance of normal blood cholesterol levels take 8 (4x2) capsules daily with meals, each dose with plenty of liquid to ensure that the capsules reach the stomach. Use this product in conjunction with food as part of a healthy, balanced diet, not as a substitute for such! Warnings: Keep out of reach of children! Always keep the exact daily dosage!